On the 28th March, 1899, the Inspector-General of Police, Mr. E. B. Fosbery, was informed by the Parliamentary Standing Committee of Public Works that the Mounted Police section, occupying barracks in Belmore Park, would be required to vacate the site by the 1st June, 1901, to make provision for the erection of Central Railway Station. The barracks were vacated on that date and the Mounted Police were then allocated temporary accommodation at the Royal Agricultural Showground, Moore Park. The Police Depot was initially occupied by the Mounted Police Trainees undergoing instruction, the Recruiting Officer and staff, and the Barrack Sergeant. In the intervening years, however, building occupancy was subject to many sectional changes. In 1962, the Centre was occupied by the Police Traffic Branch, the Police Fingerprint Bureau of Australia, No. 21 Division, the Recruiting Officer, Police Instructional Officers, Cadet Instructors, Shorthand Instructors, Drill and Physical Culture Instructors, Radio Communications Centre, Police Rescue Squad, Mounted Police, and the administrative officers of the Federation of Police and Citizens Boy’s Clubs. The location was known as the Police Depot until December, 1954, when the name was changed at the direction of the than Commissioner of Police, Mr. C. J. Delaney, to the Police Training Centre. 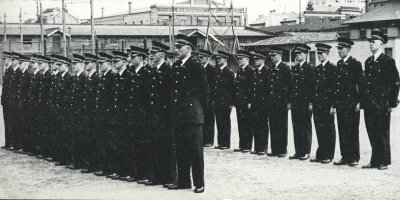 In1933, Superintendent W. J. Mackay, later Commissioner of Police, introduced a system of Police Cadets into the ranks of the New South Wales Police Force. The innovation was not immediately popular with members of the Force because it was feared that cadets would become a “select group” of potential officers, on similar parity to cadets training in selective schools of the Armed Services. When it was established, however, that the only material advantage to cadets would be sectional clerical experience and extended long service leave benefits the system was accepted and finally approved. On June 4, 1933, twelve Police Cadets, the sons of serving Policemen, were appointed to the Police Force and attached to various sections and metropolitan city stations. The Cadets were an immediate success and on the 1st October of that year, an additional 18 Cadets were recruited. Of this intake, only a few were sons of Policemen. The rate of pay was Â£2 weekly. The first intake of original Cadets was sworn in during 1936, and many of them in 1962, were serving Sergeants and Detective Sergeants in important sectional positions. Since 1933 and up until 1962, over 1,700 Cadets had been enrolled in the Police Force. Conditions of Police Cadets had improved greatly over the past two decades and in 1962 all Police Cadets received training in Statute Law, Police Procedure, Police Practice and Duties, English, Shorthand, Speech Culture, Physical Training, Squad Drill, and all sporting pursuits. A select few also attended a course of wireless instruction at the Marconi School of Wireless. In 1962 enrolment in the Police Cadet Service was open to youths between the ages of 15 and 18 years who were of excellent character, weighed approximately 10st. 7lbs., measured not less than 5ft. 8 1/2in. in height, educated to a higher primary or secondary school standard and were of such physical proportions as to reasonably indicate that upon attaining the age of 19 years they would fulfil all physical requirements for appointment to the Police Force. As young men they could now be appointed to the Police Force at the age of 19 years, but it was not the practice to accept applications for cadet appointment from youths above the age of 17 1/2 years unless the applicant was in the possession of outstanding qualifications. The object of the Cadet Service was to keep Cadets mentally and physically alert, and to embody in their training a high standard of discipline, dress, and bearing. The tutorial syllabus was designed to prepare Cadets for their future training as Probationary Constables, and to assimilate the fundamental principles of Statute Law, and the necessity of a basic understanding of human relations. At the age of 18 years selected Cadets were assigned to duty at selected school crossings in Cadet uniform. In 1962 Police Cadets effectively controlled 30 school crossings, relieving Traffic Police for more pressing and important road patrol duties. At the commencement of the Cadet system in 1933 it was the practice for Cadets to attend approved Business Colleges in their own time and at their own expense for instruction in typing and shorthand. In 1938 shorthand classes were inaugurated at the Criminal Investigation Branch under the direction of qualified Police Instructors. Attendance at these classes was on a voluntary basis. In 1940, at the instigation of Commissioner of Police, Mr. C. J. Delaney, daily shorthand instructional classes were officially included in the syllabus of studies for all Cadets. In 1962 Cadets entering the service were required to study shorthand and enter into a departmental contract to write shorthand at a speed ranging from 100 to 120 words per minute at a specified period of their training. Cadets studying the theory of shorthand were required to attend an approved business collage at their own expense, in addition to attending daily courses at the Police Training Centre. 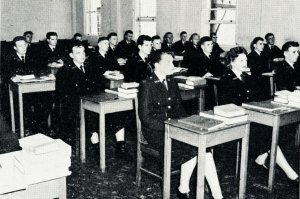 Upon graduation from the theory class Cadets terminated private tuition and then received instruction in the Low and High Speed classes conducted four mornings weekly, until they could attain their contract rate. Up until 1962 and since the inauguration of the system over 1,700 Cadets have received shorthand tuition. All had attained speeds of 120 words per minute, and 5%, had achieved speeds in excess of 150 words per minute, the qualifying standard for appointment as official departmental shorthand writers. The Police Cadet proved an outstanding success and a vital acquisition to the New South Wales Police Force in suitably preparing young men for a qualified and an efficient approach to Police procedure, and the manifold responsibilities and difficulties of their chosen career. Applications for Police employment were accepted from young men over 19 and under 30 years of age who were of excellent character, and good physique and bearing. Candidates had to be not less than 5ft. 9in. in height, weigh approximately 11st. 7lbs., and educationally qualified to pass an examination in dictation, and arithmetic. Candidates were obliged to pass a strict medical examination, and submit Birth and Baptismal Certificates and satisfactory testimonials of general character. A maximum of 90 trainees were selected every eleven weeks to undergo specialised training at the Police Training Centre. For instructional purposes, and greater efficiency, the trainees were divided into classes to enable instructors to assess more accurately the potential of the new intake. During the initial training period trainees were instructed in Statute Law, Police Practice and Procedure, First Aid, Police Communications, Physical Education, and the taking of fingerprints, Drill, and Swimming. The object of the preliminary training was to impact to trainees a basic understanding of Police Duties, the complex nature of Statute Law, a practical approach to its study, and the exercise of tolerance and understanding in its application. Seniority of candidates was based upon preliminary examination results and all round general ability. At the end of the initial training period a Passing Out Parade was held at the Police Training Centre, which was attended by the Commissioner and Deputy Commissioner of Police, the State Premier, or his representative, Police officials, relatives, and friends. Probationary Constables attached to metropolitan stations were required to attend Intermediate Instructional Classes at the Police Training Centre one day weekly prior to the commencement of the Secondary Training Course. The object of this course was to consolidate earlier instruction, and to embark upon a series of lectures covering new phases of Police activities. During this intermediate period the Probationers were obliged to attend a business college for typewriting instruction, and to undergo specialised training in morgue procedure, the serving of summonses and warrants, and licensing, traffic, criminal investigation, and vice squad duties. They were also required to attend the Sydney Quarter Sessions and various Courts of Petty Sessions for an insight into Court atmosphere and procedure. At the conclusion of ten month’s service the Probationers would return to the Police Training Centre for a further six weeks intensive course of study. The object of the Secondary Training Course was to further consolidate the principles of their earlier courses, and to introduce a number of allied subjects calculated to widen the knowledge of the Probationer. In addition to advanced instruction in Statute Law and Police Procedure instruction was also given in First Aid, Physical Training, Drill, Radio Communications, Motor Vehicle Maintenance, and Target Practice. During this period lectures were also given by the Directors of the Board of Epidemiology and Public Health, a Special Magistrate from the Children’s Court, the District Supervisor of the Statistician’s Department, and a Senior Officer of the Vice Squad. A series of specially selected films from the Criminal Investigation Library were also exhibited for visual instruction in crime detection, traffic control, and other vital subjects. At the end of the Secondary Training Course each Probationer was required to sit for a comprehensive examination embracing the full syllabus of studies. Should a Probationer fail in any subject he, or she, was retained for a period of one month, then given a further opportunity to qualify for confirmation of appointment. If by some chance he, or she, again failed their retention in the Police Force would be considered by the full Recruiting Committee.